In some previous posts, I gave play reports of our first two Mutant Future (MF) sessions. When we last left off, the mutants Jax and Berrus had a near-fatal run-in with some corn plants, and had gone back to the Hamlet of Blixter to rest. After some stimshots from Dr. Frimost, the robot doctor, and a night’s rest, they returned to the abandoned bomb shelter entrance. Now leery of the corn plants, they wisely burned them with flaming oil, and proceeded into the old shelter. Despite assurances from Zabd that they would find a cache of weapons, the shelter itself had been ransacked and nothing of value was left. However, a bit of careful searching from Jax revealed that the back wall of the shelter was false. Breaking through it revealed an opening into a tunnel, headed down to a faint glow some 200 feet away. Jax led the way down the tunnel, with Berrus and Constable Nyseld in tow. Jax hadn’t gone very far when he ran into a tripwire, setting off a directed energy burst of some sort that cooked him a bit, but more than that, alerted two Mant sentries who were positioned at the far end of the tunnel. The sentries charged and melee ensued. The party was holding its own, and had killed one Mant, but the other was joined by a Giant Ant who must have heard the commotion. 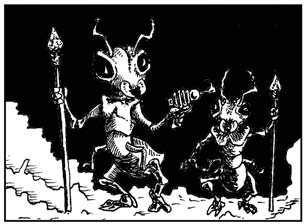 The party retreated a bit, hoping the Ant would not know of the tripwire – and sure enough, were rewarded when the Ant tripped it and was blasted, then put out of his misery by Nyseld’s revolver. The remaining Mant was killed in short order. Taking a breather, Berrus decided to investigate how the trap worked. He followed the tripwire down a small tunnel to his left, noting a small dish and powerpack bolted to the rock wall. He was able to cut the wire and detach the emitter from the wall with judicious use of a crowbar. Testing it to make sure it was not damaged, he stowed it in his pack and the party proceeded down the tunnel. As they approached the tunnel end they could see it opened into a cavern, dimly lit by small luminous pods bolted to the cave walls at regular intervals. The wall immediately to their right had two openings in it – one at each end of the cavern. Peering around the closest, they saw both openings led to a large, open space with many floor-to-ceiling stalactites and dozens of orange, leathery basketball-sized eggs laying in clusters on the cave floor. Entering the egg cavern, they saw three open exits on the far wall, all some 80 feet away. Choosing the leftmost, Jax proceeded as stealthily as he could, but was spotted by two more Mant guards and two Giant Ants. As Jax ran from the tunnel to alert the others, Berrus picked up an egg and tossed it to the nearest Mant, hoping to distract him. That did not work as planned, however – the Mant guard knocked the egg away and savagely speared it. Battle was joined yet again. Berrus made good use of his damage-turning mutation, and the four creatures had soon joined their companions, althought Jax and Nyseld were wounded in the process. Exploring this obviously guarded tunnel a bit more, Jax crept down it and spied what he surmised was the Mant queen – a huge, monstrous thing with pulsing, leathery white skin sitting in a cave. He reported back to the others, and they devised a plan of surprise attack. Berrus would enter the chamber, place the emitter on the ground and trigger it in the Queen’s general direction, then meditate into his damage-turning state. This might have worked but for the Queen’s teleport mutation – as Berrus sat down and fired the emitter, the Queen made a sickly sound of rage and pain, and defended herself the only way she could – she teleported directly on top of Berrus! This proved to be her demise, however, as the damage turning took hold just before Berrus’ concentration was broken, and the still-firing emitter did yet more close-range damage. A shocked Jax and Nyseld rushed to get Berrus out from under the Queen’s bulk, resorting to Jax’s sword and barely getting him out in time before he suffocated. Exploring the Queen’s cave, the party found a box of 100 rad-tabs and a healing pack in an unopened crate against the far wall. They decided they had had enough excitement for one day, and returned to Blixter. They managed to sell the case of rad-tabs for 240GP, but were dismayed to find out that the healing pack was dangerous to use on mutants. They donated it to Dr. Frimost in exchange for as-needed stimshots, on the condition that they were available.